If you have got this far, you are probably thinking either that you would like to meet up with some Club members and see whether you want to join in our trips or maybe you have never caved before. If your interest is in a novice trip, then read on. If you want to join a more experienced trip, jump forward to the next part of this page. In either case, you can either get in touch by e-mail to Meets-sec or you can fill in the form on the page for potential new members. A word of caution, one thing we cannot provide except at Alderley Edge is an "underground experience" for its own sake. If you want to try out caving to be able to say you have done it but have no serious interest in the sport, you are welcome to arrange a trip to Alderley either on an organised party or on an Open Day or else you should contact one of the organisations that provide caving on a professional basis (try Googling for "caving training trips"). 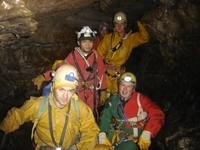 New members are always welcome in the caving and mining side of the Club. 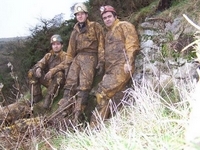 It is recognised that new caving members may need training to help them to become safe and skilful cavers. 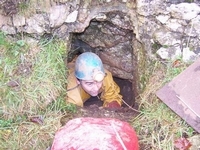 Members of the Club are therefore prepared to take novice cavers on trips in Derbyshire and Yorkshire to help them learn the sport. Trips for novices require careful planning to ensure the right ratio of experienced to new cavers and to find a suitable cave so we may not be able to arrange a novice training trip "to order". The Club has available a small amount of equipment and lights which it is able to loan to novices to help them on their first trips. After that, novices are expected to buy their own personal equipment such as clothing, helmet, light and selected safety items. 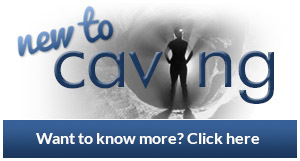 To find out more about novice trips, contact the Club by email via 'TryCaving' at the DCC. Caves typically visited by the Club for novice trips include P8, Giants, Bagshawe Cavern and Peak in Derbyshire and parts of the Kingsdale system in Yorkshire. 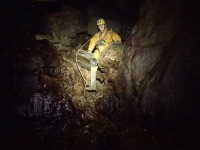 However, we also use the mines at Alderley Edge as a practice area for real caving techniques as well as trying out methods such as abseiling and prusiking on the surface (see this gallery). 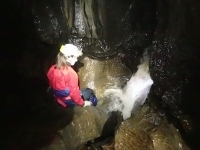 If you are interested in novice trips, go to our page for new members and see what is being planned that might suit you, or you can go to a new national site called www.newtocaving.com which provides more information on how to get started on your adventure underground. It is a condition of joining the DCC for a trip that you are covered by British Caving Assoiation insurance. There is no cost but a form has to be completed and the cover is limited to four trips in a year. The form can be downloaded HERE and it is a good idea to partly complete it before your trip. Over recent years, the balance of the Club has shifted towards work at Alderley Edge Mines. 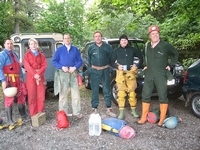 Nevertheless, many members still undertake experienced caving trips in Yorkshire, Derbyshire and South Wales. If you contact the Club via any member or fill in the form below, you will be put in touch with the members who regularly cave in limestone areas. The Club also has an overlapping membership with the Alternative Derbyshire Caving Club (which is also based in Stockport!) and which is dedicated to caving. You can also look at our meets list to see if there is anything that interests you. 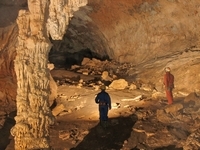 There is a selection of caving pictures in this gallery. 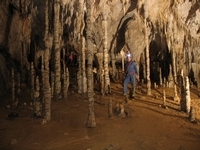 Go to the main photo gallery for more pictures of caving. Coventosa, a magnificent cave and quite easy access. Anton descending the Greasy Slab At the bottom of the main cascade Formations in Coventosa. Looking out It's a bit dirty in there!